If you have ever travelled abroad, then you might have had to change your watch to coincide with the local time at your destination. 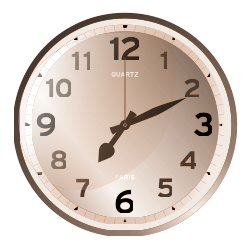 Have you ever wondered who decided where the time should change? How did they decide by how much it would differ? On a recent trip to the Royal Observatory in Greenwich , London, I discovered the answers to these questions with the help of Graham Dolan, the Senior Education Officer. You might have heard of the Royal Observatory, or of Greenwich itself. If you have, it could be because you are used to the expression "Greenwich Mean Time", or maybe you've heard of the Prime Meridian which is located at Greenwich. The NRICH article called Coordinates explains the first part of the story. Eratosthenes, a Greek scholar, was the first person to make a map of the world based on a system of grid lines. These imaginary lines are of two types: lines of latitude are "horizontal" and run parallel to the equator; lines of longitude are "vertical" and run from pole to pole. Lines of longitude are also known as meridians and the meridian passing through a certain place is called the local meridian. In the early 18th century, there was still not a good way of knowing the position of a ship at sea in terms of its longitude. People had believed that the moon would be a good way to measure position on the earth and the observatory at Greenwich was built to try and prove this theory. In 1766, the Astronomer Royal, Nevil Maskelyne, worked out where the moon would be throughout 1767 if you were standing on the earth. Maskelyne calculated the angular position of the moon in relation to several close bright stars every three hours, based on the local time at Greenwich. 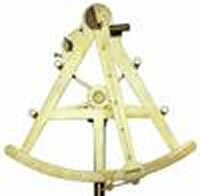 Sailors could use an instrument called a marine sextant along with the figures that Maskelyne published to find out their longitude compared with Greenwich. In fact, at the same time as this, a man called John Harrison also found a solution to the problem of measuring longitude at sea. 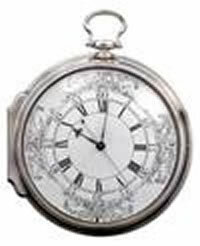 He made the first clock that would accurately tell the time on board ship and so it was another way to work out time differences, one based on the time at Greenwich and one based on the time at a particular location. This meant that longitude was measured from different places by different people - it must have been quite confusing! So, it was at the International Meridian Conference in 1884, held in the US, that it was decided it would be much more straight-forward to choose one place from which all longitude was measured. As nearly two-thirds of ships around the world were using time at Greenwich to calculate their positions, it was decided that the Greenwich Meridian would be the Prime Meridian of the world. And so it is today. The Prime Meridian at Greenwich therefore became zero degrees longitude and the time at Greenwich became known as Greenwich Mean Time. It is from this benchmark that times across the world are calculated. When it is 12 noon in Greenwich, it is 12 midnight on exactly the other side of the world, 180 degrees longitude. 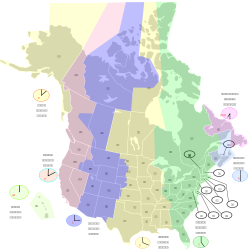 The rest of the world is divided up into 24 time zones - you could work out how many degrees wide they are! As you go from west to east, you move ahead one hour for each zone. Some countries are so large that they span more than one time zone. In the USA, for example, you would have to change your watch if you travel far enough. You might be interested to know that the Prime Meridian passes very close to Cambridge where NRICH is based. In fact, it runs through the villages of Meldreth and Hardwick, just west of Cambridge and that is where The Meridian School in Royston gets its name. Why not find out how far your school is from the Prime Meridian? You might be able to find its positionand so stand with one foot in the east and one in the west! If you would like to find out more about the Greenwich Meridian, or about modern tracking systems, then I would recommend Graham Dolan's book, "On the Line The Story of the Greenwich Meridian", published by the National Maritime Museum, Greenwich. If you are lucky enough to live near London, then why not try and visit the Museum and the Royal Observatory ? You might even be able to persuade your teacher to arrange a class visit!